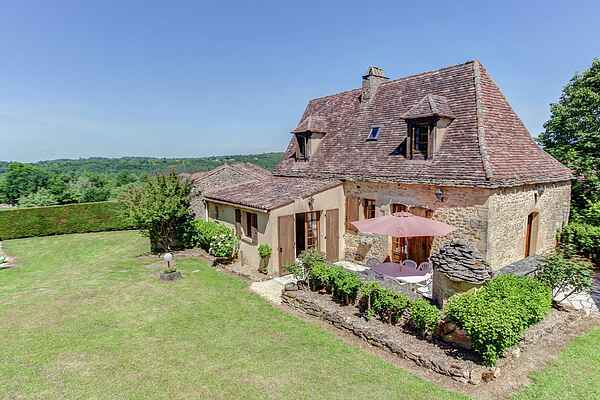 This beautiful, detached holiday home is located on top of a hill in Sainte-Foy-de-Belvès. The kids wil have a tremendous time in the large garden while you enjoy your sunny terrace, surrounded by beautiful rose bushes. Sip your glass of wine, read your book or simply enjoy the view. A dip in the private swimming pool will of course be everyone's favourite pastime. Indoors you will find a decorative fireplace, a lounge area and a separate kitchen (via two steps). This beautiful part of France you can either explore by car or with a canoe (canoe rental in Siorac-en-Périgord, 12 km). The area surrounding this holiday home is known and loved by many. We also want to convince you to try it out. A visit to one of the typical bastide villages is an absolute must. We highly recommend the towns of Belvès (9 km), Prats-du-Périgord (12 km) and Villefranche-du-Périgord (18 km), where you will find many cozy streets and beautiful old houses. Naturally, there are numerous terraces to be found here. The beautiful castles in this part of France should (and cannot) be missed. The Château des Milandes (21 km) and the impressive castle of Biron (23 km) are great fun for the young as well as the old.